A Bighorn Ram up Trailridge Road in Rocky Mountain National Park back in July of 1998. Image taken with Nikon F5, Nikon 500 f4, Kodak E100S transparency film, transformed in Samsung Galaxy s8 using an app called MIX with a filter called clay. All C&C welcome. Please click on image. Thanks. This is very cool. The clay filter actually makes it look like the image is imposed on a clay foundation. The background, in particular, appears to reveal tool marks pressed into the clay. The ram is well posed and a handsome specimen. Very nice image and treatment, Joe. Beautifully done, Joe- I like the textures very much. To me they look more like woodcuts than clay, but no matter-they work very well. (In fact I like the wood feel even better....) The Ram is a handsome species as well, very nicely presented. Excellent! 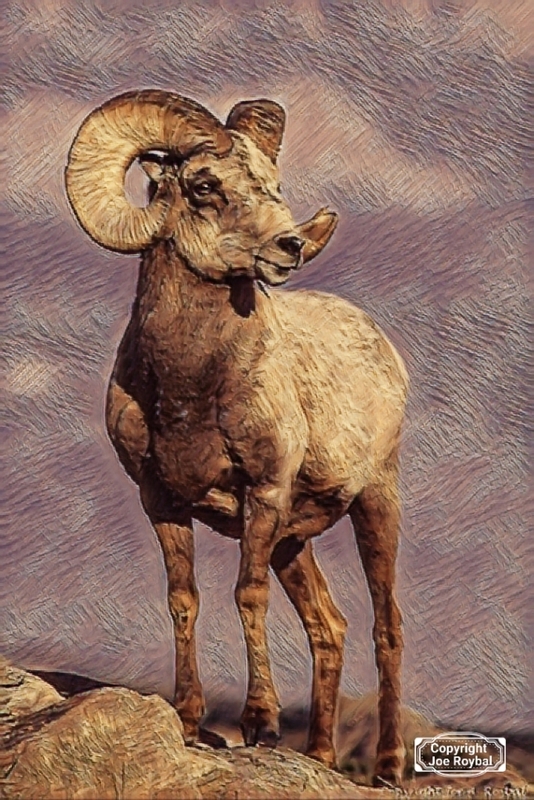 Love the pose of this majestic ram, Joe, and the effect looks like he's been carved out of wood! Very nicely done. Thanks, Carol. The app may be called “clay’, but you and Cindy are right about the look. Some other images are even a totally different look when this filter is applied.